Mistletoe is the common name for various plants of the order Santalales, belonging to the families Santalaceae, Loranthaceae and Misodendraceae. European Mistletoe is can b recognised by its smooth-edged oval leaves in pairs along the stem, and its clusters of two to six waxy white berries. American Mistletoe looks similar, but has shorter, broader leaves and longer clusters of ten or more berries. Mistletoe is commonly used as a Christmas decoration. 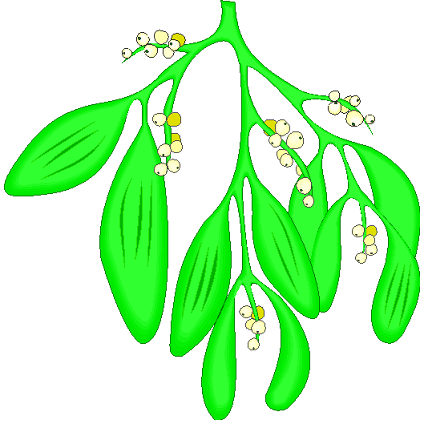 Different species of mistletoe are used in different parts of the world: Viscum album is used in Europe whereas Phoradendron leucarpum is used in North America. A Christmas tradition is that when any two people meet under a hanging sprig of mistletoe, they are obliged to kiss.